Supreme 5 star Gold holiday accommodation for family/friends. They have a games room full of various Puzzles Games Bicycles to use not forgetting the Table Tennis & Pool Table . We just could not fault anything. You will not find a better place to stay in that area I am sure. Another excellent stay. We have stayed in many holiday cottages over the years and can honestly say Cape Cottage is the best. Loved it - as a wheelchair user this property was outstanding. Had a lovely few days in Cape Cottage. All was immaculately presented and we were made very welcome by Jill. A fantastic playbarn for the children and a great swimming pool. Full-on respite for grandparents, parents and children of all ages. Marvellous fault free accommodation for our elderly parents with full en-suite facilities. There is a games room and swimming pool with a manner of services provided. Definitely a retreat for all ages who will benefit from the quiet surrounds and comfort this cottage provides. Amazing accommodation, perfect for families and groups of friends. So much to do onsite, facilities were brilliant. We stayed as a group of four for four nights in January 2018 . The property was tucked away at the end of a long farm drive. All the facilities we wished for were present, the accommodation was warm, very spacious and suitable for occupation by two couples. There were lovely views and plenty of room for outdoor activity which would appeal to families, namely spacious play barn and indoor pool. Perfect venue regardless of the weather. Private outside barbeque and eating area for warmer weather occupation. The owner was very helpful and keen to ensure our stay was comfortable. The bathroom/ wet room was well set out for the disabled. We enjoyed our short stay immensely and would thoroughly recommend Cape Cottage to all. A very good value family break away together. We try to get together here each year as we have enjoyed every one. It really is ideal, something for all of us, swimming in November is always a pleasure. Jill and family are always so welcoming. I recommend this venue as there are many different types of accommodation to suit all. We have returned for our fifth visit now at Lower Wood Farm and once again we are very pleased to leave an excellent review. It was our first time staying in Cape Cottage and we would thoroughly recommend it. Excellent facilities, fantastic comfort and we were pleasantly surprised at the extra Halloween activities organised by the owners for the children staying on site. The only small downside for us is the poor internet signal as we need to check in with our business constantly but it's an irritation rather than a deal breaker. Once again we had a really enjoyable week and we hope to return again! Beautiful cottage. Comfortable and well equipped. Excellent facilities for small children. Enjoyed the Swimming pool and Play Barn. Great location and good facilities. Swimming pool was always quiet and we were often the only people in there. Play barn went down very well with the kids and it was great being so close to it in cape cottage. The title says it all. Good quality furnishings and equipment. Plentiful supply of towels and tableware. Best facilities ever for disabled wheelchair bound user. Only difficulty was gravel area in front of cottage, more slabs needed. Very quiet location and local attractions within easy reach. Ideal children's facilities and excellent swimming pool. Very good. Only downside was the power cuts which the cottage was not responsible for! Our children really enjoyed the facilities. The cottage was large and well kept, in a lovely setting. We have been before, and would come again. We have just had another lovely weekend at Lower Wood Farm, Mautby to celebrate our daughters birthday which falls on Halloween. The owner had even entertained the children the week before as it was half term by putting up pumpkins and other activities for them to do before having a party, these had been left up which was nice for us, nothing is too much trouble. We had Cape Cottage this time as my husband is disabled and it was amazing, so easy for him to access shower and kitchen equipment. The weather made it even more special as we had sunshine in October and could sit on patio for breakfast. Pool in excellent condition so clean and accessible for all of us. We will definitely go back. We've just returned from our 3rd visit to Lower Wood Farm. Cape Cottage is ideal for us as it is wheelchair accessible and has been specifically designed for disabled guests and their families/carers. In addition to the very nice wet room, there is a separate bathroom in the accessible part of the building for non-disabled guests too. The entire cottage has been designed to a high standard with luxurious linens and excellent quality beds and furniture. Jill, the owner/host is always most welcoming and is on hand throughout the day to deal with any queries. We needed to hire in a 'pillow lift' device in advance of our stay and Jill was happy to facilitate this, liaising with the mobility provider etc. The grounds at Lower Wood Farm are beautiful and maintained to a very high standard, as is the swimming pool, both of which add to a relaxing, enjoyable holiday. There is a BBQ area for the cottages, with a separate one on the patio of Cape Cottage to make it easier. We enjoyed this facility with our friends. We've always had a wonderful time at Lower Wood Farm and look forward to visiting again in the future. On arrival, we were amazed as we entered the cottage with the solid wood construction. Every possible appliance is provided with many extras not normally found. The owner is always on hand if required but then blends into the back ground. The property was immaculate with small things like the cups and glasses all facing the same way. I would have no hesitation in recommending this property to family and friends. Once again we have enjoyed ourselves at Lowerwood Farm. The accommodation is superb and leaves nothing to be desired. The pool facilities are excellent for both young and old alike and kept spotlessly clean. Every need is catered for and Jill is an excellent host who goes out of her way everyday to ensure that her 'guests' are satisfied. Would I recommend this property to others? Absolutely I would! Excellent Holiday, will be returning! The cottage was spacious, clean and comfortable. Everything we could have wanted had been provided for the children. We were also very impressed with the facilities that Lowerwood Farm had to offer. It made for a very relaxing and enjoyable holiday with our 6 year old, 4 year old and 15 month old. They had the best time. We will definitely be returning. Lot's to do great for the kids, very relaxing for the parents. You don't need to go out and do loads with the kids, as it's all on site. Swimming pool very warm and never very busy, nice walks through the country side, everything very close to the cottage, Caister, Yarmouth etc. Will book up for next year. Beautiful accommodation in beautiful surroundings. Cape Cottage was immaculate and well equipped. The pool, playbarn and pushbikes meant the kids were kept occupied. Great Yarmouth only 10 minutes drive from the site, Caister on Sea 5 minutes. Loads to do in the vicinity although some days we had to drag the kids out because they were more than happy to stay on site! It was a lovely relaxing holiday, I only wish we had found the site when the girls were younger as the facilities for young children are excellent. What an amazing venue for a family holiday! The property was immaculate and catered for everything we needed, a real home from home. The kids loved the play barn and garden, which meant we could relax whilst they wore themselves out, very safe environment for little ones. The swimming pool was kept in pristine condition and large enough to have a proper swim. The location is great too, short walks and bike rides from the property, alternatively the stunning Norfolk coast and beaches are a short drive away, Winterton by the Sea is particularly nice. Whatever you're looking for from a family holiday you'll find it here, can't recommend it enough and we'll definitely be going back. What a fabulous cottage - great grounds and marvellous facilities. The disabled facilities were good and we wanted for nothing within the cottage. I had some reservations about being opposite the play barn - I needn't have - we played pool most nights !! A small sheltered patio area - my only request would be proper outside chairs as opposed to a picnic style bench - we did note it was wheelchair friendly but not see easy for an octogenarian to use. The indoor pool was lovely. The outstanding feature for me was the grounds - beautifully tended. A great location - have booked again! Our kids enjoyed everything about this property - particularly the pool and the play barn - and we thought it was lovely. Looking forward to coming back. My wife and I rented both 'Cape Cottage' & 'The Farmhouse' for our family and grandchildren to celebrate her 70th Birthday. The property was built to an amazing standard with quality fittings everywhere. The separate wet room and access was excellent and with solid oak flooring everywhere, it was easy to use a wheelchair around the place. The 'Family stayed in the Farmhouse, but we all gathered in Cape Cottage where there was masses of room for 6 adults and 4 children. From the welcome tray on arrival to ther starter packs of items such as cleaning materials and tea and coffee making facilities we wanted for nothing. The children were never bored making full use of the well stocked 'Play Barn' and the indoor swimming pool. For the winter months, the rental was excellent value, and even in the Summer at peak times, the property is well worth the asking price. Cape Cottage was very well designed for disabled people, with a superb wet room. Plenty of space for wheel chair users. Unfortunately there were a few unfortunate incidences whilst we were occupying the premises. Quickly resolved by the owners but feel some could be avoided if the more checks were made before renting out. On the day of our departure, there was a power cut which commenced at 7 am and the electricity had not returned when we left at 10 am. Feel that the site should have some form of back up ie a generator especially for Cape Cottage. It could be that the person required electricity for some form of medical equipment eg for dialysis. Altogether a very welcome experience to celebrate a special birthday. Excellent all round, this cottage was hired for my elderly parents and was excellent, the facilities in cape cottage were well thought out for someone with limited mobility, the owner Jill made my parents feel very welcome. Would highly recommend Lower Wood Farm. Excellent accommodation with fantastic facilities for us and our 2 young sons. The pool and playroom are fabulous, perfect to entertain 2 little ones. Surrounding area was nice and we enjoyed some good days out. We really enjoyed our break in Cape Cottage at Lowerwood Farm. Our children (5 and 3) had a fantastic time making full use of the outdoor space, swimming pool and play-barn. The cottage itself was spotless and well equipped. The best ever disabled accommodation. We have stayed in many cottages over the years and this was the best ever by far. We were taken back a bit at the cost but it was school holidays and we are used to term time costs. Jill was a superb host and made sure we had everything we needed. The space in the cottage was great for the wheelchair, we didn't have to rearrange the furniture which is what we have to do in most cottages we stay in. The wet room was enormous, as was our bedroom. The swimming pool was the main attraction for our family but there was a lot of other equipment that kept them amused. We can't wait to return again. Always have a wonderful holiday at Lower Wood Farm Cottages. Jill is a great host and always ensures your every need is catered for. Her cottages are by far the best we have ever stayed in. The cottages have everything you want to make you feel comfortable during your stay - home from home. All the cottages we have stayed in at LW have been cleaned to a very high standard, important to me. The surrounding grounds improve every time we visit LW, most recently another outside area with a climbling frame for your children to play on. Don't think you could improve LW, but Jill always finds something to make it better each time. On our most recent stay we were delighted to find our own BBQ outside Cape Cottage. Thanks to Jill and her team of staff for making our holidays by far some of our best to date! Beautiful property and grounds etc. Amazing for disabled guests - just needed a slightly wider path outside for wheelchair access . Excellent facilities both in the cottage and outside. Swimming pool ideal size and very clean. We found the Bridge Inn at Acle an excellent family place to eat. Good food and plenty on the plate. Wroxham Broads is a great day out. We have stayed in Cape Cottage before and found it to be outstanding. It met all the needs for our 92 year old disabled Mum and she called it her 'Home from Home'. Lowerwood Farm is a safe haven of play for our autistic 11 year old and the swimming pool is second to none. From the slow cooker in the kitchen to the jigsaws and jigsaw board Jill has provided for every holiday need to the best of her ability. I would not hesitate to recommend this wonderful complex tucked away in a corner of Norfolk. The complex was recommended by a work colleague and a good one it was to. We had Cape Cottage ( a upgrade - thank you) which was excellent. Plenty of space and well equipped. Very ideal for the Play Barn so our daughter was able to use in the knowledge we could see her and only next door. Also ideal for the cast and visiting the Broads and Norwich etc. Swimming Pool was also made use of every day - in fact we had sole use as no one else was staying due to the time of year. Talking of time of year the complex appears to have a lot of "out door activities" such as climbing frames and toys but due to the weather did not make full use of this.... may be next time. Thank you for a lovely stay. My wife and 3 sons (aged 22, 18 and 2 spent a fantastic week in Cape Cottage. 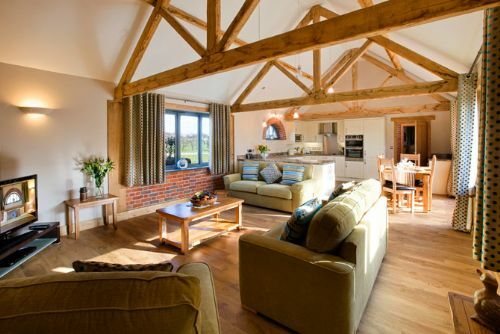 A little pricey but very much a 4 star barn conversion in a fantastic rural location with everything you'd ever need. Shame the weather wasn't a little better but we made the most of everything anyway. Jill (manageress) was great, making sure we were okay, settled and had all that we needed. No complaints and would highly recommend Lower Wood Farm cottages. My wife is in a wheelchair and we had great difficulty in finding somewhere that catered for all our needs cape cottage covered everything and more. Would highly recommend to anyone in a similar situation. Thank you for your review. We are so pleased you found Cape Cottage provided all the extra's to ensure your wife had an enjoyable stay. Cape Cottage is just lovely. Only a weekend break but it was as comfortable and as nice as being at home. Will recommend it to all our friends and relatives. The facilities are just great and we are looking forward to our stay next Easter. Merry Christmas to all the family, we look forward to meeting you all again at Easter.